After two days of general statements, World Intellectual Property Organization delegates delved into more substantial subjects, and convened in small closed informal discussions to try to solve issues left open during the year. Among them is the composition of WIPO Coordination Committee and Program and Budget Committee, both WIPO governing bodies. Others include potential treaties on harmonising international applications by industrial designs creators, and on the protection of broadcasting organisations against signal theft. The 58th series of WIPO Assemblies are taking place from 24 September to 2 October. The assemblies include meetings of WIPO governing bodies and reports of WIPO committees, but also yearly assemblies of WIPO treaties governing bodies, or unions. 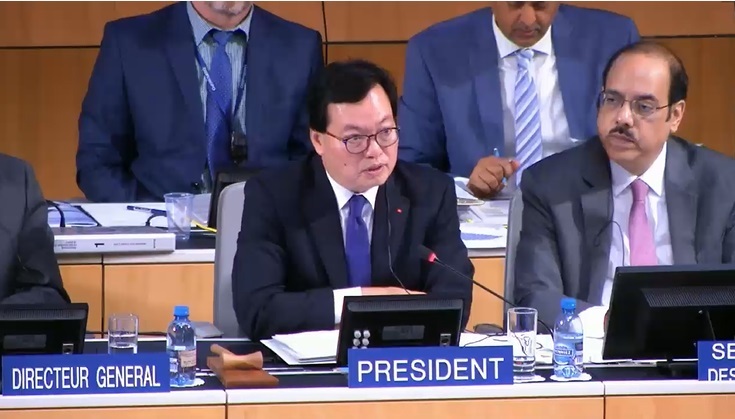 For several items on the agenda [pdf] WIPO General Assembly Chair Ambassador Duong Chi Dung from Vietnam suggested that delegates meet in an informal and closed setting and report back at an unspecified time. The report by the Independent Advisory Oversight Committee (IAOC), the report by the External Auditor, and the report by the Director of the Internal Oversight Division (IOD) were all noted by the General Assembly. El Salvador on behalf of the Group of Latin American and Caribbean countries (GRULAC) remarked during the IAOC discussions on the assessment of regional offices. GRULAC, the El Salvadorian delegate said, was not able to comment on preliminary results of the Brazilian WIPO external office. The United States noted an increase in allegations compared to previous IOD reporting periods, and asked if an explanation could be provided by the secretariat. The report should clarify the number of investigation cases currently open, the US delegate said. Switzerland for Group B also noted an increased in insubordination and misconduct cases and required more information on potential reasons for the increase. Several WIPO committee reports were noted by the General Assembly yesterday. The report on the Standing Committee on the Law of Patents (SCP) was noted and countries remarked positively on the work programme adopted in July for the next session of the SCP, from 3-6 December (IPW, WIPO, 13 July 2018). Also noted was the report on the Standing Committee on the Law of Trademarks, Industrial Designs and Geographical Indications (SCT). The European Union and the group of Central European and Baltic States warned that the SCT should not seek to interpret or review the text of the controversial Geneva Act on the protection of geographical indications, which was negotiated in another venue in WIPO. A number of countries welcomed the adoption of a work programme on geographical indications in the committee during the last session of the SCT. Brazil said the country is seeking “exponential registrations” of geographical indications. At present, the delegate said, 68 GIs have been granted in Brazil. The report of the Committee on Development and Intellectual Property (CDIP) was also noted. The General Assembly started hearing delegates comment on the report of the Intergovernmental Committee on Intellectual Property and Genetic Resources, Traditional Knowledge and Folklore (IGC). Informal consultations were called for the General Assembly’s decision on the composition and expansion of the WIPO Coordination Committee, with five vacant seats. The issue is sensitive because the committee takes key decisions such as on top staff posts, and composition can shift the weight among regions. Also under informal discussion is the composition of the Program and Budget Committee (PBC). The Asia and Pacific Group tabled a proposal in 2017, resubmitted [pdf] for this General Assembly, calling for the PBC to be open to the full participation of all interested WIPO members. Indonesia on behalf of the group argued that the last time the PBC group allocation was considered was 2007. The delegate argued that the current seat allocation is not fairly proportioned and does not reflect the relative size of WIPO regional groups. The PBC is a key governing body and there is no legal basis guiding seat allocation in the PBC from regional groups, or prevent the full participation of all countries, he said. WIPO committees report to the General Assembly, which is left to decide on unresolved issues. The protection of broadcasting organisations has been under negotiation for over 20 years at the WIPO Standing Committee on Copyright and Related Rights (SCCR) and some delegations find it is time to move the negotiations to a diplomatic conference (high-level negotiating meeting) to finish a treaty. However, delegates find it difficult to agree on basic principles such as what the treaty is expected to protect. Some argue that the treaty would be outdated even before its adoption if it was only based on a 2007 WIPO mandate: signal-based, and in the traditional sense. Those countries, such as the European Union countries, argue that the treaty should answer current and future needs of broadcasters, include transmission over the internet, and catch-up services on television for example, and take into account rapid technological advances. Argentina proposed a timeline for the treaty. The proposal sets out a programme to finalise the key issues and have a full draft treaty text for consideration during the 37th session of the SCCR, scheduled from 26-30 November. The 38th SCCR session would consider progress and if at the end of the session some issues remain, the proposal suggests that a further session of the SCCR be organised before the 2019 General Assembly. The 38th session, according to the proposal, should propose a preliminary date and venue for a diplomatic conference to take place about six months after the 38th session (before the end of 2019). In 2019, the WIPO General Assembly would confirm the proposed date and venue for the diplomatic conference. The United States said it will provide a new proposal for the next session of the SCCR, which they hope will bridge gaps between member states. Informal discussions also are being held on the work programme of the SCCR, and on its agenda. For example, some items are discussed on an ad hoc basis and some delegations would like to see them become standing agenda items, such as the issue of resale right for visual artists, originally submitted by Senegal and Congo. SCCR Chair Daren Tang from Singapore was appointed as facilitator for the informal consultations during the Assemblies. Informal consultations were also set up on the issue of establishing new WIPO external offices, and in which four countries they should be established. And to break the standstill on a potential treaty to facilitate industrial designs international applications, informal consultations are also ongoing, chaired by María Inés Rodríguez from Argentina. The report of the Program and Budget Committee was also noted by the General Assembly. The PBC met from 10-14 September. During the PBC discussion, the United States and France jousted on the Lisbon Agreement for the Protection of Appellations of Origin and their International Registration, and it particular its Geneva Act of the Lisbon Agreement on Appellations of Origin and Geographical Indications. This agreement includes a small group of WIPO members. The US, an opponent of the Geneva Act, challenged the administration of the Geneva Act by WIPO without the approval of the Paris Union or the WIPO General Assembly, while France, one of the largest owners of GIs, argued that the Geneva Act belongs to the Lisbon system, which is itself managed by WIPO. During the last PBC meeting, the US and others not benefiting strongly from GIs, again raised concern that some unions, particularly the Patent Cooperation Treaty (PCT), are being used to pay for others, such as Lisbon, which runs a perennial deficit. The US said that WIPO members had agreed that unions would look to ways to move toward financial self-sustainability but that in fact the recent Lisbon Union meeting (of which the US is not a member) had taken actions “that can only further increase its deficit.” The Hague and Madrid unions also did not have it on the agenda until the US put it there, he said. Non-GI beneficiaries Australia and Sweden, which is part of the European Union, spoke in support of the US statement on unions being self-sustaining and Australia also expressed disappointment that the Lisbon Union did not discuss the issue at its last meeting. Japan, another non-GI beneficiary state, said each union being self-sustaining is in the WIPO treaties. Brazil said there is an agreement that unions should look at ways to fund themselves. Italy, a GI beneficiary country, said there is a positive trend and stressed the principle of WIPO as a single entity with a “spirit of solidarity.” WIPO rules set out that WIPO should support all global IP systems, and went so far as to tie it in with the UN Sustainable Development Goals for 2030. Changing the current allocation methodology of WIPO could impact the overall functioning of WIPO as a specialized agency, the Italian delegate said. Switzerland, also a GI beneficiary, said the current allocation gives detailed guidance in a transparent way, is a pragmatic approach, and that changing the methodology would call into question all activity that generates a negative revenue number. As the PCT is the primary source of WIPO revenue, it is “normal” that it be used for a variety of activities. The result of a lack of consensus to change the current methodology means that the existing methodology would remain, sources noted. France cited a quote from Albert Einstein, who the delegate noted once worked in the IP office of Switzerland in Bern, that “insanity is doing the same thing over and over again and expecting a different result.” This was directed at the countries that continue to raise the wish to change the allocation methodology. The US said it appeared that “scare tactics” were being used by the threats that changing allocation would affect the overall organisation functioning negatively. “Right now, WIPO has a body that is healthy but has links that are damaged. It would be insanity to ignore these damaged body parts.” Addressing their financial problems is in their treaty obligations. China asked for a full study of impact. The issue was carried forward to this week’s Assembly, where it was discussed and noted, as reported above. UK’s First WIPO Committee Chair in Quarter Century? The PBC meeting in early September elected Amb. Andrew Staines, the deputy representative of the mission of the United Kingdom to the UN, said to be the first chair of a WIPO committee in 25 years. In a comparatively lower stress non-budget year, Staines was able to guide the group to quick agreements on most subjects with unusual efficiency. Officials elected to serve as vice-chairs for the 2018-2019 period were Raúl Vargas Juârez of Mexico, and Liene Grike, advisor, economic and intellectual property affairs, mission of Latvia to the World Trade Organization. Separately, European Patent Office President Antonio Campinos was on hand at the WIPO Assemblies at the start of the week. It is typical for the EPO president to attend the annual WIPO assemblies. One reason he may have been there was to promote candidates for three posts at the EPO that are up for election, including the vice president for operations, where Steve Rowan of the UK is Campinos’ favoured candidate, according to sources. On 10 October, the EPO Advisory Board will choose, sources said. "WIPO General Assemblies Mid-Week Notebook: Heating Up" by Intellectual Property Watch is licensed under a Creative Commons Attribution-NonCommercial-ShareAlike 4.0 International License.